Upgrade instructions for hacked boards. THIS SOFTWARE MODIFICATION IS PROVIDED BY THE AUTHOR "AS IS" AND ANY EXPRESS OR IMPLIED WARRANTIES, INCLUDING, BUT NOT LIMITED TO, THE IMPLIED WARRANTIES OF MERCHANTABILITY AND FITNESS FOR A PARTICULAR PURPOSE ARE DISCLAIMED. IN NO EVENT SHALL THE AUTHOR BE LIABLE FOR ANY DIRECT, INDIRECT, INCIDENTAL, SPECIAL, EXEMPLARY, OR CONSEQUENTIAL DAMAGES (INCLUDING, BUT NOT LIMITED TO, PROCUREMENT OF SUBSTITUTE GOODS OR SERVICES; LOSS OF USE, DATA, OR PROFITS; OR BUSINESS INTERRUPTION) HOWEVER CAUSED AND ON ANY THEORY OF LIABILITY, WHETHER IN CONTRACT, STRICT LIABILITY, OR TORT (INCLUDING NEGLIGENCE OR OTHERWISE) ARISING IN ANY WAY OUT OF THE USE OF THIS SOFTWARE, EVEN IF ADVISED OF THE POSSIBILITY OF SUCH DAMAGE. 1. Backup your existing XMB installation first. -> Download your entire "XMB" folder. 2. Backup your existing MySQL database via phpMyAdmin. 6. Open your config.php file. 8. Save the new config file. 9. Did I already mention to backup your files and database? Well did you do it? 10. If you did a complete backup good for you! Enjoy! Avatars with https:// are now allowed. 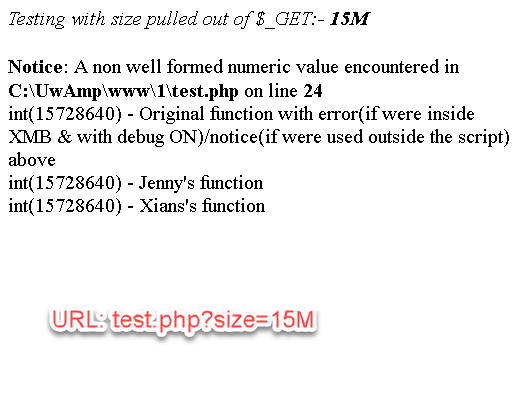 Apparently there is some sort of formatting error in function phpShorthandValue. Server using PHP 7.1.8, also tested on 5.6(no errors were present). Yeah, it's also present 1.9.11. Either way, since it's a notice, you could probably get rid of displaying the error via ini_settings, but that doesn't really solve the problem. I'd like to have all warnings on. Has been applied to the download in the original post and file download. That's how I fixed it for myself, yet I'm not sure what this function is used for in order to properly test it, but value is being returned the same as in non edited version of PHP 5. Either way, thanks for your code too. I might double check the output of both fixes, but if responses are identical I think my way is a bit less messy as far as code goes. 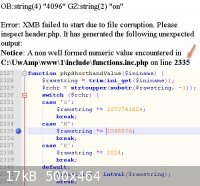 // Validate maxattachsize with PHP configuration. Uses the function to validate filesize uploads to make sure that it doesn't exceed what is in the forum settings. Nice, now I can actually test it out. Thanks for the pointers. Alright, I wrote a little script to test that mess. As suspected, original throws an error while other two works just fine. I have attached the script, so you could test it for yourself. Use $_GET['size'] for testing custom values, but this is optional. Since Jenny says her way is a cleaner piece of code I'll probably fix that with my own board before I finally upgrade the server to PHP 7. Just a quick question, how do I upgrade from 5.6 to 7.0 on Debian 8 Jessie? I don't want to break anything if I try reading tutorials and such and I know I can trust the XMB Community. Xian, do you think we should have a number system for the beta? Just in case people who aren't following this topic download from sourceforge may think the beta is the same, whereas it's already changed I think 3 times? Since Jenny says her way is a cleaner piece of code I'll probably fix that with my own board before I finally upgrade the server to PHP 7. I don't recommend using those fixes, because none of those those 3 functions(including original) were convenient enough. If user uses two letter format (MB, KB, GB) instead of one( M,K,G) current functions just bails out or shows complete gibberish. In regards of php upgrading, you most likely need to use a package manager. Something like apt-get install php7.1 should do. P.S. If it does nothing you need to add repositories manually, I think. LOL! You're right. Let's number them like that. I will update them when I get home. Thanks for the link! I will see what I can do with some of them. Would be nice if this feature could be done or perhaps made a hack, seeing as most forum software has it.